Is Exercise Appropriate For Patients With Gastrointestinal Disorders? Gastrointestinal disorders can be a major burden on an individual’s freedom. GI disorders may require you to schedule bathroom breaks throughout the day. You may experience bloating, stomach pain, diarrhea or other symptoms. None of these symptoms make for a very easy daily routine. There are a number of ways to actively combat such problems. The three primary methods for battling GI disorders at home are diet management, stress management and exercise. Diet management can be particularly helpful if your GI disorder is triggered by certain foods. Stress management can also be helpful, because a decrease in stress can reduce your susceptibility to a flare up in symptoms. Introducing exercise into the treatment of your GI disorder is a very promising and dynamic approach. 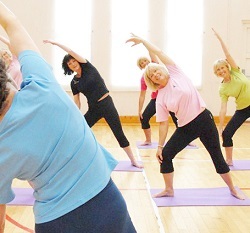 Exercise has been shown to improve a patient’s experience of GI disorder symptoms. A study from the American Journal of Gastroenterology examined the relationship between exercise and the symptoms of irritable bowel syndrome. Half of the patients were instructed to exercise, while the other half did not. The patients were questioned about their symptoms before and after the experiment. Interestingly, patients in the exercise group rated items such as abdominal pain and quality of life improvement as being 46 points better than the other group. The researchers went on to say that incorporating a small amount of exercise into a patient’s routine could improve the patient experience and decrease symptoms. 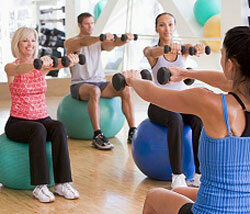 Therefore, exercise can be useful for decreasing the nagging symptoms of GI disorders. Psychological effects are another important result of exercise in GI disorder patients. Think back to the last time you exercised. It is likely that afterwards you felt not only tired, but also a bit relieved. Stressors in life seem to disappear when people are focused on lifting weights, running or performing a proper upward-facing dog pose. Research has supported the idea that exercise is a great method for reducing stress. This has valuable implications for GI disorders. GI disorders can be made worse by stress. Patients that are stressed tend to suffer from symptoms, which are more frequent and more severe. This can be explained by the fact that stress can serve as a trigger for GI disorders just like a poor diet. It is also important to mention that the nagging symptoms of GI disorders can be very frustrating. This frustration will almost certainly affect how happy a patient feels. The stress reduction from exercise will help to alleviate this frustration. An exercising patient will not only experience stress relief, but also elevated mood. There are direct physical effects of exercise that help to alleviate indirect complications with GI disorders. Exercise is well known as a way of weight management. GI disorders leave many people spending time sedentary. The weight management effects of exercise can offset this. One problem that is connected to GI disorders is chronic fatigue syndrome. Chronic fatigue syndrome can lead to a sedentary lifestyle just like GI disorder symptoms. For these people, getting in daily exercise can be invaluable in preventing their weight from increasing to unhealthy levels. Another direct physical effect occurs in the digestive system itself. GI disorders are well known for causing digestive problems including constipation and diarrhea. For these patients, any improvements in digestion are welcome. Working out can aid in the digestion of food. Specifically, exercise has been shown to return the intestines to normal contractions, very effective for symptoms like constipation. A morning trip to the gym could mean feeling less discomfort later in the day or having an easier time managing trips to the restroom. Exercise might not be the key to solving all of the problems related to gastrointestinal disorders. However, it can improve a patient’s quality of life in multiple ways. Adding exercise into one’s routine can minimize symptoms, alleviate stress and help the patient avoid some of the secondary effects of GI disorders. While exercise is not a cure-all, it is certainly helpful and a useful part of a patient’s lifestyle. As with making any change in one’s life, starting an exercise routine can be difficult. For people suffering from GI disorders, this is especially true. There is no need to worry, because there are some easy to follow tips for exercising with a GI disorder. No need to pull something. GI disorders can make exercise tricky. Research has shown that vigorous exercise can actually make symptoms worse. The best approach to exercise is to eliminate jarring movements typical of high intensity exercise. It is probably best to avoid sports like basketball that require jumping and quick lateral movement. In addition, contact sports like football are not ideal. In terms of weight lifting, squat jumps would be an example of a movement that could prove to be problematic. Aim for low impact exercise. Asking questions makes you safer. This is going to sound like a drug commercial, but talk to your doctor before you start a workout routine. It is likely that you are dealing with symptoms from GI disorders, diet management and treatments. With all of these variables in play, asking your physician about any doubts you have concerning exercise is the smart move. Know your body and your symptoms. Symptoms of digestive discomfort, common with GI disorders, can be easily recognized by patients. If you feel that your symptoms are flaring up after working out consistently, then take some time to rest and recover. If a new medication is having a nasty effect on you, then don’t go to the gym until you feel better (Definitely, inform your doctor in this scenario). Knowing your limits is important with GI disorders and fitness in general. Interest is a strong motivator. <spanfont-family: 'Verdana','sans-serif';">Bloating, diarrhea, nausea, pain and fatigue are all associated with some GI disorders. These symptoms can hamper your desire to workout. So, pick a workout you will enjoy. Choose your favorite sport, attend a class you are interested in, or exercise competitively with a friend. Enjoying your routine will make things a lot easier. Act, don’t plan. Do not fall into the trap of over-thinking your workout. You will end up planning too much. Exercise will seem like a difficult task. This combined with frustrating symptoms will lead you to the couch instead of the gym. Sometimes, it is better just to jump into a routine. You should still stick to low impact exercise, but doing a small unplanned routine is better than avoiding the world’s greatest workout for people with GI disorders. There are a number of options. Many of these exercises, you have probably heard of, not realizing they were low impact. Walking is an overlooked workout. It is unlikely to cause additional discomfort and can burn plenty of calories. Qigong is less well known. Qigong is a Chinese exercise technique that uses fluid, choreographed, repetitive movements to cultivate personal energy. Most importantly, it is a form of gentle exercise ideal for patients with GI disorders. Swimming offers another option. It is a very common sport with a reputation for being very rigorous. While swimming in sprints can be a high impact exercise, swimming at a more relaxed pace can be a soothing low impact workout for individuals with digestive discomfort. Tai Chi is a Chinese martial art that can be beneficial for learning self-defense and improving one’s health. It represents another ideal exercise for patients with GI disorders. Tai Chi employs a series of choreographed slow movements to bring about increased focus. There is also a strong emphasis on breathing control. Tai Chi represents the kind of active low impact exercise ideal for those with symptoms of GI disorders. Lastly, there are low impact exercises inside your favorite local gym. This is a convenient option for anyone with a gym membership. For, example, you can use the cycling machine. This allows you to set a difficulty, a speed and time limit. You can ride the bike at an intensity level suitable for your symptoms.